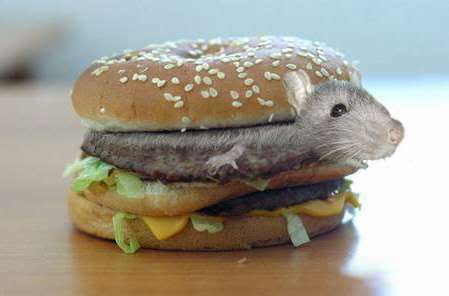 Ratburgers in the ratlands. Mmm, yum. Them old folks are just takers anyway. Have you ever seen the differentials between what old “the Greatest Generation” paid into Medicare and what they take out? Social Security? You should be less jejune. I love how Wimberly inserts a BS picture and then distances himself from his self-perpetuated slander. Because the best vantage point from which to comment on US budget politics is the UK, amirite? Have you ever seen the differentials between what old â€œthe Greatest Generationâ€ paid into Medicare and what they take out? Social Security? Was I mis-informed? Are either of them savings vehicles? Ad hominem attacks are a sign of weak position. I do have to plead guilty to being a Brit, though I donÂ´t live in the UK. If IÂ´m going to write about political events from far away, I might as well write about ones that make a big difference. Tories in Britain have accepted the main lines of the welfare state since Neville Chamberlain. The ratburger satire was done better, and in a much more extreme form, by Jonathan Swift in his Modest Proposal of 1729. And the “sequester” was quickly amended (slightly) when it began to interfere with the ability of members of Congress to fly back to their districts on weekends and on the ability of prosperous Americans to make their business travel plans. The rest of the sequester was left intact. The flip side of market failure, political failure. The House GOP framework, pushed by Rep. Paul Ryan (R-WI), would raise the borrowing limit for six weeks while replacing across-the-board spending cuts (known as sequestration) with cuts to Social Security and Medicare benefits. Ryan went to college because the American people helped him via Social Security disability payments. And this monster pays back the very culture than enabled him like this? Did the Greeks have some sort of chimera that was part snake, part upstart crow, part libertarian and part goat? Whatever the causes of this crisis, it isnÂ´t BuchananÂ´s Â¨public choiceÂ¨ mechanism where democratic politicians anywhere seek the rents of power for themselves. This one clearly depends on design flaws in the antique US Constitution (the balance of powers is taken so far as to lend itself to gridlock), some dumb past legislation (the debt limit acts, rather thanfolding debt authorisation into budgets the way everybody else handles it), and now the capture of the Congressional GOP by right-wing extremists who despise the constant compromises the system requires. Sorry, this crisis is particularly American, and is not due to any general flaws in democracy. +1 on everything, except that I would say “peculiarly American” rather than particularly. And you’re absolutely right about our antique Constitution, but I’m afraid of what might happen if we tried to bring the thing into the 20th Century. Iâ€™m afraid of what might happen if we tried to bring the [Constitution] into the 20th Century. Agreed. And why should we feel that way? Because of the “peculiarly American” personalities we see stomping on the stage right now. We seem to be suffering from a plague of libertarians who as they take a shot for mumps in their left arm, look to choke off the funding of science with their right. To have a great country you must have a a great people. What can you build out of a narcissistic pile of me-first, me-only libertarians? Clearly, any time you stop robbing Peter to pay Paul, you render Paul worse off. Any time you continue doing it you render Peter worse off. Continue to ignore that half of the equation. Whoops, forgot to add my name. Is that problem ever going to be fixed? In the Bellmore lexicon, “tax” and “rob” are synonyms, as are “taxation” and “robbery”. Brett: do you really object to your taxes going for food aid to the old couple cited in the report, viz. Bill Anderson (81) and his wife June (83), of Grand Rapids? Of course he does. If everyone was just a successful capitalist predator, we wouldn’t have these darned takers, right? Brett, do you darken the door of any churches? I hope not. No, I’m merely suggesting his hypocrisy would be even more spectacular in that case. Do you need to ask that question? Of course he objects to it — the more interesting question to me is this: Will he admit he finds it objectionable, and on what grounds is it objectionable. James, in a typical year I, firmly in the middle class, contribute more direct charity to the poor than our VP Biden does out of an income many times larger. Clearly, I have no objection to giving my money to the poor. What I don’t believe is that you should be charitable with somebody else’s money. Unless, you know, they voluntarily gave it to you to be charitable with. This is one of the major breakpoints between the right and left in America. The Right believes in being charitable with their own money, the Left in being ‘charitable’ with other people’s money. Put another way, the Right believes in charity, the Left in entitlements. Your way is really convenient, I guess: Given progressive taxation, you get to dump most of the burden on somebody else, and still feel good. …the Right believes in charity, the Left in entitlements. Well, no. The Right got all that dough by stealing it in the first place. And they used the government to do so. It’s not theirs. And that’s good enough — salvation comes through faith, not works. Given the apparent lack of Righties observed rushing to the aid of the Andersons of this country offering charity in their time of need, it would seem that the system we had in place was not only more convenient, but also more effective. You know, the system we used to have where we collectively decided it was worthwhile to tax ourselves to pay for systems to identify and meet these needs reliably and efficiently. If you really think your patchwork of private individuals “being charitable with their own money” outperforms taxpayers democratically choosing to be charitable with some of “our own money”, why not prove it to us all and convince your fellow Righties to identify all the Andersons in need and deliver quality nutritious meals to their door (just as the system you criticize was doing) before they starve to death. You’d better hurry — you’re already two weeks behind. Let’s see. Let’s let the kind-hearted people spend all their money helping others, while the mean-hearted people spend theirs buying up the economy and the government. Good plan, Brett. You’re handing us back over to the plutocrats that we fought in 1776. American plutocrats are Redcoat Royalists, back in charge. BrettÂ´s position isnÂ´t even a return to the Gilded Age. In British terms, it amounts to a rejection of the Elizabethan Poor Law Act of 1601, which created a duty on local authorities (at the time, parishes) to maintain the resident poor. Vagrant poor were Those People and could be flogged and driven away. The conditions (workhouses) were deliberately humiliating; still, the poor were fed, as of right. The law was a response to the collapse after the Reformation of the mediaeval non-governmental system of charitable foundations connected to the Church. Libertarians here put themselves in the same leaky ideological boat as sentimental Catholic mediaevalists like G.K Chesterton. I shouldn’t feed the troll, but since so many people have done so, another morsel can’t be too harmless. Brett is admitting that he is a moocher/taker/thief, or at least in cahoots with same. He drives on government roads. He probably went to government schools, at least for his primary and secondary education. He flies on government-directed skies. He is kept safe by government police and a government army. (He might contest this last point, pointing to his own mighty weapons. But everybody is armed in Iraq, and nobody is safe.) He probably does his hunting (if any) on government land. Other needs of Brett are provided by corporations–government-created entities. He pays for it all in government money. All of this uses taxpayer dollars. All, in Brett-world, is the product of theft. In Brett-world, Ted Kaczynski is the only honest man. reading between the lines of mr. bellmore’s most recent comment above, he is only concerned about taxation if it is used for the uplift and nourishment of other humans. that use should be entirely in private hands according to him. his ignorance of the brutality and depth of poverty and deprivation during times prior to the modern welfare state that began to develop in the 19th century is, apparently, of a magnitude i could only describe as legendary. is the ignorance willful? for the sake of his humanity i hope not. I’m not so sure about the “decay of empathy” thesis. I rather doubt the rapacious wealthy ever had much empathy for the rest of us. What’s happened is that a vast industry of enabling those who lack empathy has emerged. Much of it can be tied to the ideological blinders of anti-Communism, but that’s taking the long, historian’s view of things. More recently, the Democratic Party’s embrace of the values of “free trade” and “small government” didn’t reclaim those terms from the right, but embedded them as part of a disturbing, anti-citizen elite consensus against the vast majority of us. How else did you think we got to a proposed “compromise” to put the government back in operation that potentially involves gutting the most widely shared, successful, and cost-effective government programs like Social Security in the name of “reform” completely unrelated to the current legislative issues? How else did we end up with a massive subsidy for insurance companies, rather than national health care? It’s gotten to the point where we need a party that actually believes in government that works…Wait a second, that’s the Greens, but you’ll have a hard time voting for THEM in many ares of the nation. Keeping alternatives off the ballot and the “wrong” people from voting seems to be the only thing that the Ds and Rs can agree on where they need to make government work. And, miracle of miracles, it mostly does in this particular case. That’s the workings of “democracy” in the 21st century USA. The rest of us an just starve. The party is there, already. It’s always there. America has a number of political parties, it just has a shortage of political labels. We form the coalition, fight the election, then govern, instead of the European model where you fight the election, form the coalition, then govern. In the 70’s, 80’s and 90’s the Dixiecrats left one “party” for the other one. Goo-goo environmentalist Republicans went the other way. The people who make up, and vote for, the members House Progressive Caucus could — potentially — change the direction of the institutional Democratic “Party” — actually the Democratic coalition — just as the Tea Party has moved the Republican “Party”. That being said, I’m not completely down on the idea that the Democratic Party will be the vehicle of change, if _that_ possibility exists. That’s where the votes are. But I think it’ll require outsiders taking over the party, there’s little sign of anything but “Stay the course, We’re not Republicans…!” from within. And you MUST do better than that to change the fundamental flaws – political, economic, and with respect to fundamental human rights — that infect the American body politic. Going with the flow has gotten us…exactly where we are. We keep hearing that the Tea Party is a tiny group of radical, anti-government zealots who have been successful through disciplined organization and skillful use of the Primary process. O.K. fine. But, where are (is) the majority? Since, it seems that everyone who is not a tea bagger hates them, why aren’t they voted out in a landslide? The “sane Republicans” are in the same place the “sane Democrats” are: Fear-town. Convinced that the Other Side is more evil than their own loonies, they consistently vote for their perception of lesser evil. This is how the vast majority of the electorate chooses who to vote for in the US, and is how we managed to achieve the high-quality government we enjoy today. As a naturalized citizen I take voting to be more of a holy duty than an optional whim. In my opinion we could take a clue from the ACA, and make voting an obligation of citizenship. Even if you choose, “none of the above,” by insisting that you make some choice I believe it would lead to a more knowledgeable, and involved, citizenry.